Cargo containers have been around for decades, but it’s only in the past couple of years that their use as habitable space has become increasingly widespread. 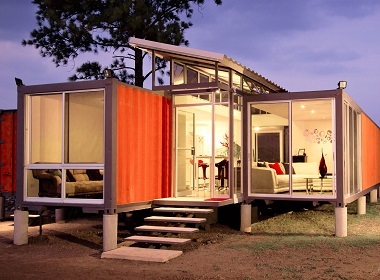 A growing number of architects and interior designers are now turning to these intermodal steel units for structural inspiration for a wide range of reasons – and here, we bring you some basic cargotechture info to help you make up your mind whether you would agree to live in one of these container-based homes. Since container-based homes are a result of upcycling that involves minimal processing, by opting for a cargo unit-made home instead of brick and mortar one, you’ll be doing the planet a favor. For added sustainability and energy independence, you can also deck your container home with some green accessories as solar panels and water tanks to collect and filter rainfall – this will significantly cut your monthly bills and contribute to minimal stake in overall global pollution. Another upside of homes made from shipping containers, mobility and modular nature are an asset in a world where habitable space is shrinking fast. This means that you can easily transport your home and plop it anywhere you feel like living for a while, and add new units without extensive modifications if you decide to settle down – now that’s a cool feature that can help you work and travel across the country without having to rent out an apartment every time you need to move. Usually made of stainless steel, shipping containers are extremely durable, weather-resistant and vermin-proof. Thanks to their internal isolation and rugged external construction with waterproof coating, homes built from cargo containers can stand quite a bit of tough weather and off-road love, so they will provide a long-term housing solution, according to recognized container experts. Another upside of container-made homes, their functional versatility is a great asset for future home owners who want their living space to be flexible and adaptable purpose-wise. With minimal money and time required, you can turn your container-based home into a makeshift or permanent office or studio: simply swap the existing furnishings with other purpose-specific pieces and voila – your former bedroom or living room can be a fresh workspace, outdoor storage room or she shed. However modular, container homes come in the shape of prefab boxes with fixed dimensions and expanding separate rooms without extensive adjustment projects is not feasible. Though you can technically add new units, the original ones will remain the same size-wise, so if you want your new home to have rooms that are larger than standard container units, you should consider some other housing options. Due to their limited size, shipping containers are also highly unrewarding in terms of furnishing with conventional furniture. Fitting non-collapsible pieces into a container home is tough, and if you opt for traditional, fixed-size bedding, you will have to make up for the spatial investment by settling for another foldable piece of furniture like chairs or tables. So, what’s your take on container homes? Even with their limited size and not as spacious habitable space, container homes are a convenient, low-cost option for would-be home owners who want to get the best property value for their money. With some careful layout planning and a handful of foldable furnishing pieces – or better yet, multiple container units at hand – your home sweet home can become a masterpiece of modern architecture and interior design, and at a highly affordable price too.